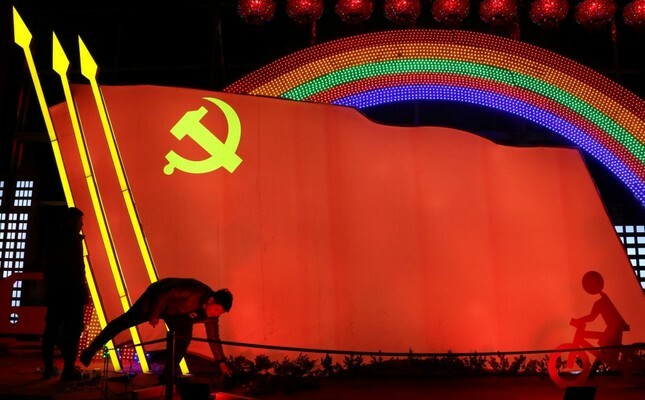 Men check on a light installation in the shape of the party flag of the Communist Party of China set up to celebrate the upcoming Chinese Lunar New Year, in Jining, Shandong province, China, Jan. 29, 2019. The political history of modern China has seen many prominent figures such as generals, politicians and rebels paving the way for China's successes in the 21st century. Although many of them are nameless soldiers, who died in wars, three of the most famous figures to have won recognition for their contributions, thoughts and policies toward the Chinese state and society are Sun Yat-sen, Mao Zedong and Deng Xiaoping. In this article, I would like to explain the legacies of Sun Yat-sen, Mao Zedong and Deng Xiaoping in building today's China and its transforming agenda. He was an idealistic revolutionist, supported by the Chinese who were anti-Qing, who was the founder of the Republic of China in 1912 following the decline of the Manchu-Qing Dynasty. In this regard, he presided over the Revolutionary Alliance, which was established on Aug. 20, 1905, in Japan. The Sun and the Revolutionary Alliance were behind several uprisings against the Manchu government; the last of which occurred in 1911, forcing the Manchu-Qing dynasty to accept the revolutionaries' demands for a new China. He was the leader of the Nationalist Party (Kuomintang), which was the successor to the Society to Rejuvenate China, established on Nov. 24, 1894. He presented his political ideals in the "Three Principles of the People" which advocates nationalism, democracy and socialism. His intention with his three principles was to make China strong, democratic, and sovereign. He has been as one of the unifying elements for China's political and social fields. For example, in 2018, China commemorated the 152nd anniversary of the birth of Sun Yat-Sen by showing him as a "great national hero, patriotic and pioneer of China's democratic revolution." In addition to this, he is known as the founder of modern China and a pioneer of revolution among many Chinese people including the communists. In my opinion, he is the key character in the unity of modern China. He played a vital role in demolishing Manchurian China's last Dynasty. He paved the way for the formation of a new China despite facing many obstacles during his leadership in Nationalist China. However, he could not achieve the unification of all of China during his time. His legacy is mostly seen in Taiwan, or the Republic of China, as a distinct state system and social life than that of mainland China. It is due to Taiwan being home to the nationalists, who retreated from mainland China, that his principles fit that nation. As a result, Taiwan is a democratic nation, and respectful of human rights. He was a communist revolutionary who became the forefather of Communist China in 1949. He was fascinated by Marxism. Maoism refers to Mao's political, military and ideological thoughts; all of which includes the Hundred Flower Campaigns, Great Leap Forward and Cultural Revolution, actions that were launched during his chairmanship of the Chinese Communist Party (CCP). Later in his career, he experienced harsh criticisms over his policies. The Hundred Flower Campaigns was the name of the CCP program that encouraged the Chinese to criticize CCP's policies in light of Mao's slogan: "Letting a hundred flowers blossom and a hundred schools of thought contend is the policy for promoting progress in the arts and the sciences and a flourishing socialist culture in our land." Mao's primary goal with this policy was to accelerate the development of science and the arts in China. However, this policy lasted only six weeks in 1957 due to harsh criticism over CCP's policies. As a result of the unwelcome criticism, many people were executed, imprisoned and dismissed from jobs and so on. The Cultural Revolution was initiated by Mao between 1966 and 1976. The main targets of the Cultural Revolution were the promotion of nonstop class struggles and the continuation of the revolution. Additionally, Mao was aware that his position was in danger following the failures of policies such as the Great Leap Forward, and so he acted against his national enemies by mobilizing Chinese youth across the country. Once again, China paid a heavy price as millions of Chinese, including intellectuals, teachers, experts, officials in authority and all bourgeois people were killed. This action did not bring about any social progress or economic development, instead, there was hunger, turmoil, violence and stagnation for China. His biggest achievement may have been the unification of China under the Chinese Communist regime until 1949. His soldiers of peasant origin were important in fighting against the nationalists, as well as the Japanese soldiers during the Sino-Japanese war between 1937 and 1945. His thoughts affected the formation of the new People's Republic of China as a state system and social life and still affects Chinese political life today. Unfortunately, Maoist political thoughts have been fading away due to the policies of modern China. After Mao's death, the new ruling elites adopted different policies in various areas. In addition, there have been claims in some circles that Mao brought more death; more turmoil and instability than stability, and productivity and unity to China during his leadership. Today's China has inherited Mao Zedong's strict state control over its people and continuing the communist regime. Hence, imprisonment, execution and dismissal from jobs over criticism of the Chinese Communist Party are still implemented by the state. He was known as the father of reforms in China which included a reform and opening-up policy, which have lasted more than four decades. As a result, the Chinese economy transformed from a centralized economy to a market-driven economy. He was the senior vice-premier and the paramount leader after the death of Mao Zedong. In addition, he was the first Chinese leader who visited the U.S.in 1979, with the Democracy Wall Movement and Tiananmen Square protests occurring in his time. He is the main architect of many reforms in the political, economic and social fields following Mao's era, and these reforms helped China maintain domestic stability and rapid economic growth which increased the welfare of the Chinese people. Some of his reforms include the one-child policy to control the increasing population of China, expansion of personal freedoms, the opening of China to the world in order to attract foreign investments, to improve trade and cultural relations with other countries, as well as to decentralize the economy. China should be thankful to Deng Xiaoping for his role in introducing China to the world. Xiaoping's brave political and economic policies became important initial steps in the Chinese dream of becoming the powerful country it once was in ancient times. The legacy of Xiaoping's policies enhanced the foundations of China's continuing economic success, which has impacted the social life of the Chinese people. In addition, his legacy allowed China to integrate more into the international community, and to achieve progress without focusing on other countries' political polity. The short backgrounds of the three Chinese leaders show they made significant contributions to China. These contributions range from ideological beliefs, thoughts, principles, economic beliefs, political and military structures. It can be claimed that, as a result of the contributions of these three eminent leaders, the leadership in today's China has seen positive transformations in the state agenda and social life. China is on its way to accomplishing its primary goal of becoming a superpower, moving on from a passive country to an assertive country demanding unification with Taiwan and transforming from a low-income society to an upper middle-income society over four decades. Additionally, by recognizing Sun's legacy, along with the rise in its power, China is more determined than ever to make a unification with Taiwan as part of the One China Policy framework. Generally, three leaders still hold positions of great prestige among Chinese Communist Party members and modern Chinese society. These three leaders desired for a common goal which was to turn China into a powerful and viable state, despite differences in their ideologies and policies. However, they could not foresee the strong China that exists today. It was their sacrifices that laid the foundations of today's China. Lastly, we can say that the history of modern China began with Sun Yat-sen's struggles against Qing-China. The nation then found itself united under Mao Zedong's Communist Party, finally, integrated into the international community during the Deng Xiaoping era.